This loop hike has all the ingredients of adventure: rugged canyons, alluring scenery, and orienteering. 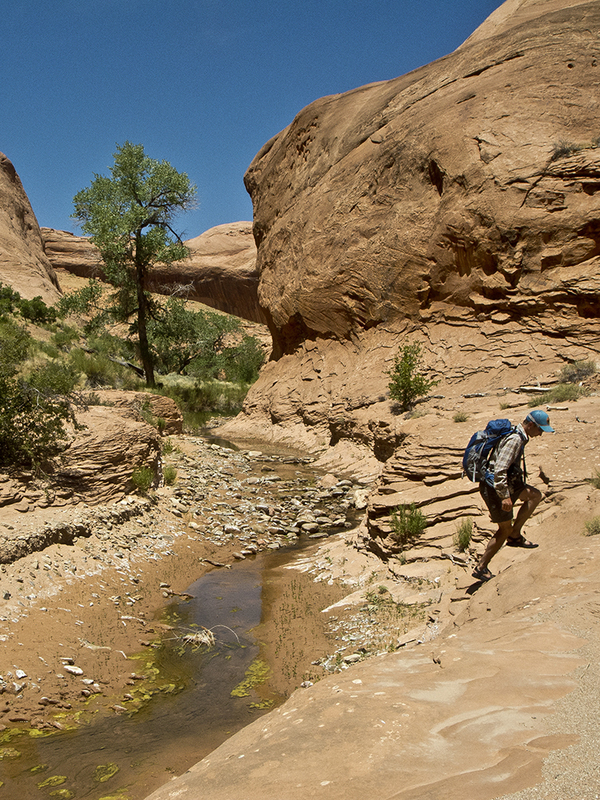 The tributaries of the Escalante River offer exceptional scenery accessible only by remote and challenging hiking routes. This loop hike is best suited for committed canyon hikers with route-finding abilities, as the last section requires a 1.5-mile cross-country trek back to the trailhead. Bring a topo map or GPS with you, and know how to read it. Also, check the weather forecast before you leave town — the two canyons that make up most of the loop have narrows sections with little escape potential, thus are dangerous during flash floods. From the trailhead, a footpath begins behind the trail register box and leads southeast down a sand dune. You pass a rock outcropping shaped like a graduation cap, and then continue across sandy slopes to descend Sooner Bench. After 0.25 mile, you reach the bottom of an unnamed drainage that flows into Willow Creek. 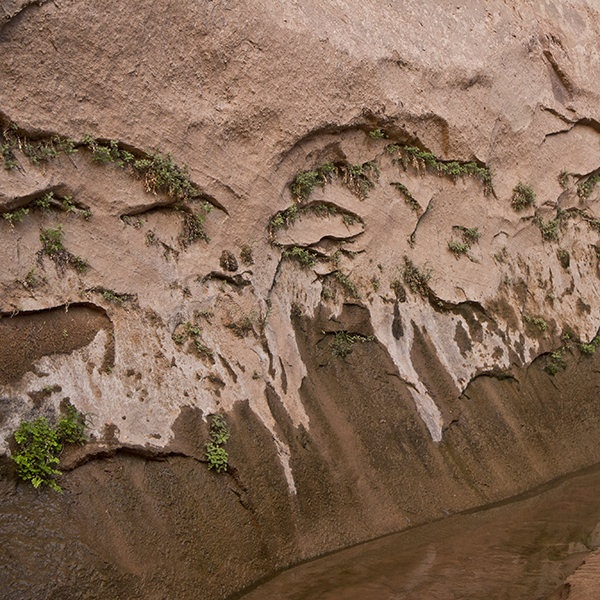 The burnt orange walls of Navajo Sandstone form rolling domes, and periodic low slots (less than 10 feet tall) have been carved into the bed of the canyon. High routes bypass these sections for more efficient hiking, but you can opt to take the time for a slower squeeze through the slots. As you exit the last slot section, a dry drainage comes in from the right; continue southeast downcanyon. Willow Creek comes in from the right, with stagnant pools preceding the flowing creek. You can hike along the creek or take a high route that ascends a sandy bench and hooks around the left side of a slickrock dome before rejoining the creek bed. 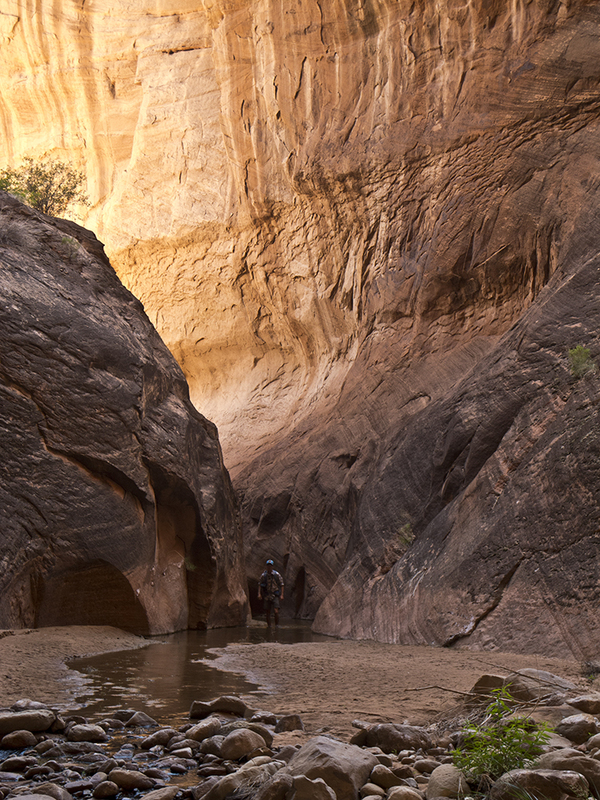 At about 1.5 miles the canyon narrows, forcing you to walk in the clear water that’s ankle to calf deep. The easy slosh follows the creek’s meanders, and around 2.25 miles you arrive at Broken Bow Arch, named after a Native American artifact found beneath its span. 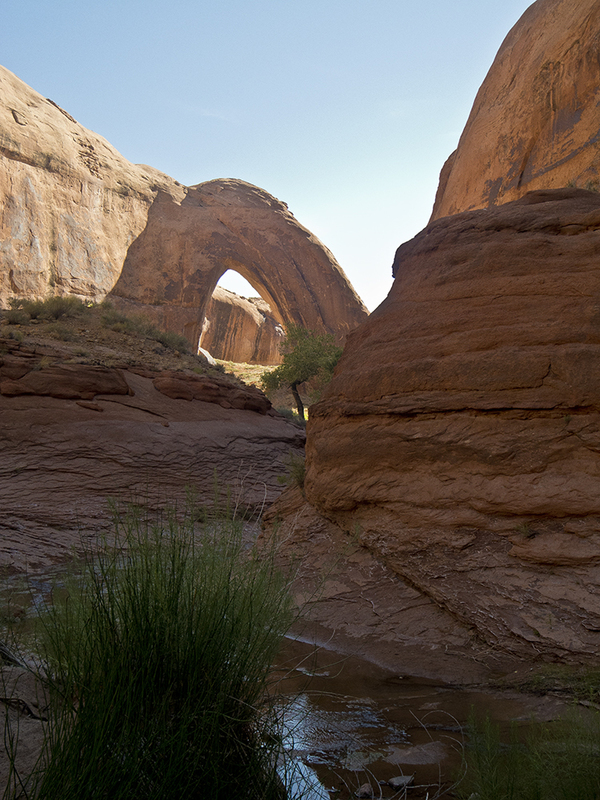 The creek has undercut the sandstone walls below the arch, creating a shady stretch of hiking. Another half mile upcanyon you arrive at the junction with Fortymile Gulch. Turn left, following this canyon upstream for the loop hike described here. 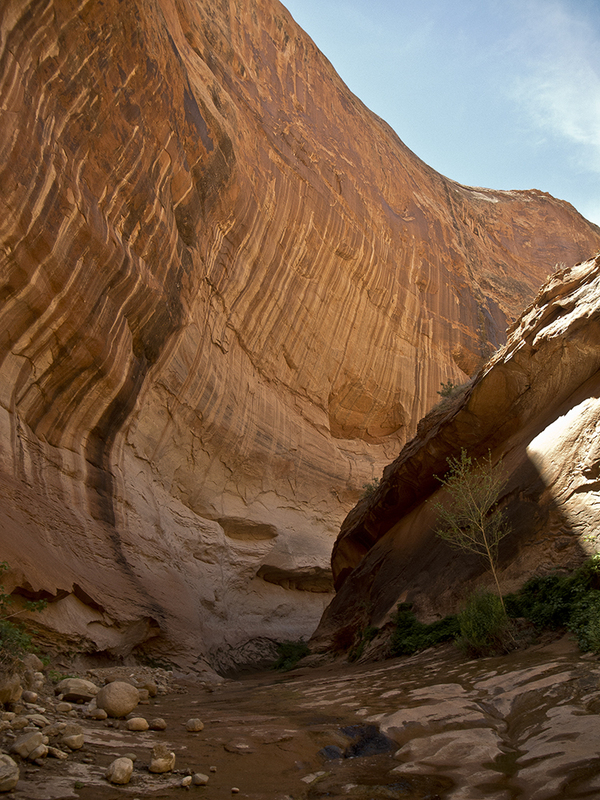 If you continue downstream, you’ll reach the Escalante River in another 1.5 miles. Fortymile Gulch looks nearly identical to the canyon you were just in. Sculpted walls form a narrow channel, and tadpoles and water striders play in the crystal clear water. As you proceed northwest upcanyon, you encounter a series of pools — be prepared to get wet. Depending on water levels, you may have to wade through chest-deep water or swim with your pack overhead. A major tributary joins the canyon around 5 miles; veer left at the giant logjam to continue heading west. In the next half mile, the canyon walls begin to diminish, sandy benches fill the canyon floor, and the creek dries up. Cottonwood trees high on the benches offer some shade, but expect a hot, exposed hike in the wash bottom. Around 6 miles, you pass another tributary on your right; hug the left canyon wall and start looking for an exit route out of the wash. In a half mile, look for a slickrock ramp that allows you to climb to the top of Sooner Bench. Don’t rely on cairns — you may find several, or more likely none. Once atop Sooner Bench, head southeast across the rolling slickrock hills and sand dunes. A GPS or topo map is strongly recommended to help you navigate back to the trailhead, 1.5 miles in the distance. You won’t be able to see your vehicle right away; stay on your bearing, cross a few drainages, and you should reach the trailhead around 7.8 miles. Continue heading southeast on this road for 42 miles, passing Dance Hall Rock, Carcass Wash, and Sooner Wash. Turn left on the gravel spur road (marked Road 276), driving an additional 1.5 miles to the trailhead. You won’t see many obvious signs that you’re in the right place, except a nondescript metal trail register box on the east side of the looped parking area.